After a dog disrupted the overwintering process of an eastern box turtle hatchling last week, we were faced with the dilemma of how to put him/her back and allow natural overwintering or brumation to take place. This baby needs to brumate! An eastern box turtle that hatched in the summer of 2018 is facing its first winter. (Photo by Tim O’Brien). I tried to research methods others have used to introduce hatchlings into late season brumation, but couldn’t find out very much. So, I crafted my own process based on careful thought and intuition based on my many years as an amateur herpetologist. My plan was to house the hatchling within a paper tube that would deteriorate within the ground, yet afford the little turtle some breathing space until he acclimated. We cooled the turtle to 50 degrees overnight. The next day I dug a hole next to a brumating adult so I could be reasonably confident this was a good spot. Since they can’t dig very well, hatchlings likely brumate under leaf litter. But I wasn’t comfortable just placing the little guy under leaves that late in the season. Since most adults brumate at a depth of 10 centimeters or less (about 4 inches), I placed the hatchling at that depth. I decided to use a paper tube plugged each end with soft detritus and some breathing space in the middle. Box turtles spend the winter about 4 inches below a soft layer of decomposing leaves and soil. (Photo by Tim O’Brien). I put the turtle in the tube and placed the tube at a 45 degree angle within the hole. This angle would allow him to dig deeper if need be or crawl out if he wanted to. 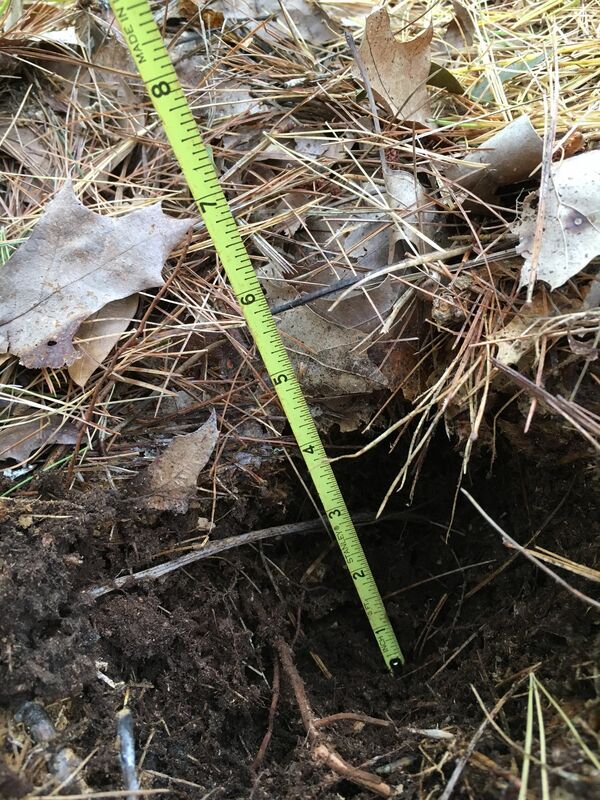 I also placed an Onset temperature logger in the hole at 10cm to record temperatures all winter. 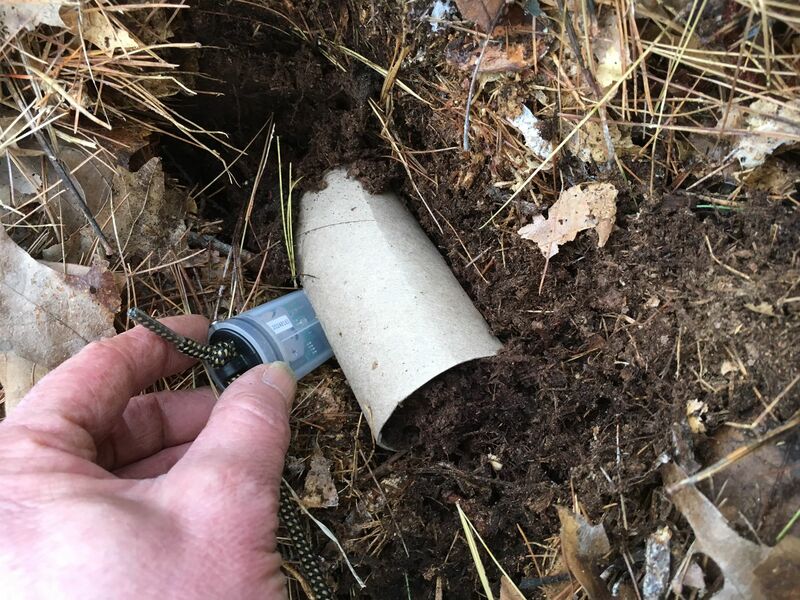 As I’ve reported in the past year, I’m currently involved in a study of box turtle brumation which includes recording soil and air temperatures at turtle overwintering spots around the sanctuary. The paper tube will serve as a sort of house to ensure the hatchling has some initial protection and the ability to move if necessary. (Photo by Tim O’Brien). I’ll monitor the young turtle throughout the winter since I don’t want the tube to collapse and prevent his emergence in the spring, assuming that he makes it. But I sure hope he does. I’ll keep you posted! 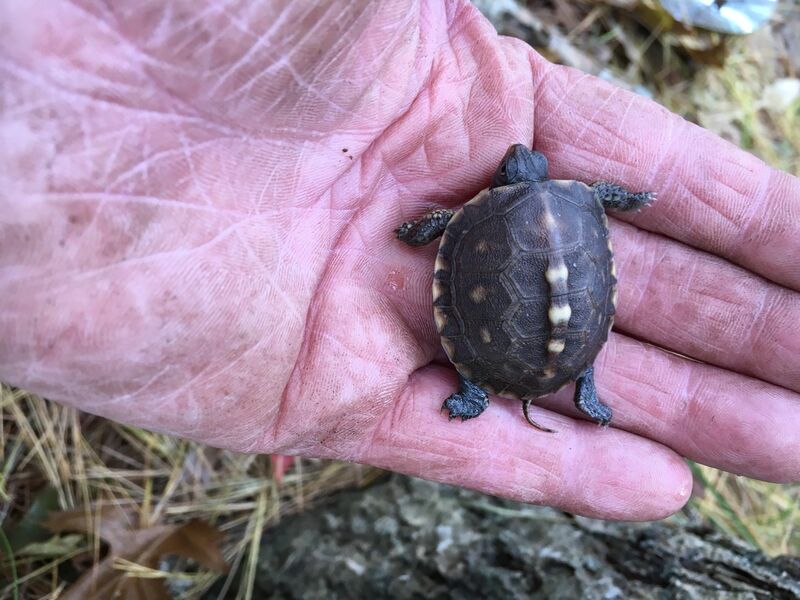 This post was contributed by Wellfleet Bay volunteer and box turtle researcher Tim O’Brien. This entry was posted in Updates on November 27, 2018 by Wellfleet Bay. Well now that little one has a cheering squad! Please do let us know how things are going. Brilliant idea and I wish the little one good luck!